Everything from insurance to travel is being impacted. Interstate highway 45 is submerged during Hurricane Harvey, Houston, Texas on Aug. 27, 2017. The hurricane's economic impact could be felt far beyond the oil and gas businesses. Massive flooding caused by Harvey along Texas' refinery-rich coast could have long-standing and far-reaching consequences for the state's oil and gas industry and the larger U.S. economy. 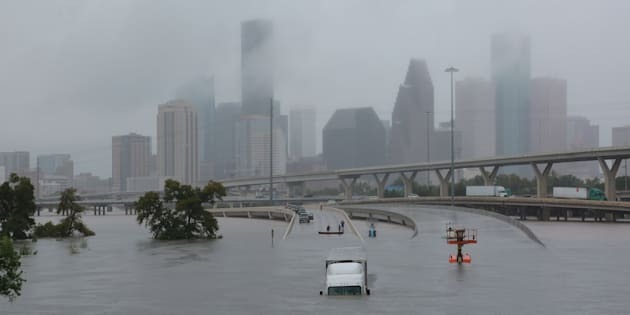 The storm's remnants left much of Houston underwater on Sunday, and the National Weather Service says it's not over yet: Some parts of Houston and its suburbs could end up with as much as 50 inches (1.3 metres) of rain. Harvey's toll on air travel in the U.S. is set to extend into Monday, with the tracking service FlightAware.com reporting that more than 1,400 flights already have been cancelled. That's in addition to more than 2,000 cancelled over the weekend. The Valero Houston Refinery is threatened by the swelling waters of the Buffalo Bayou after Hurricane Harvey inundated the Texas Gulf coast with rain, Houston, Texas, on Aug. 27, 2017. The agency estimated that platforms accounting for about 22 per cent of oil production and 26 per cent of natural gas output in the Gulf had been shut down. Researchers at Texas A&M University estimated that the storm would knock out power for at least 1.25 million people in Texas. They said the hardest-hit areas will include Corpus Christi, which is on the coast, and San Antonio, which is about 140 miles (225 kilometres) inland.